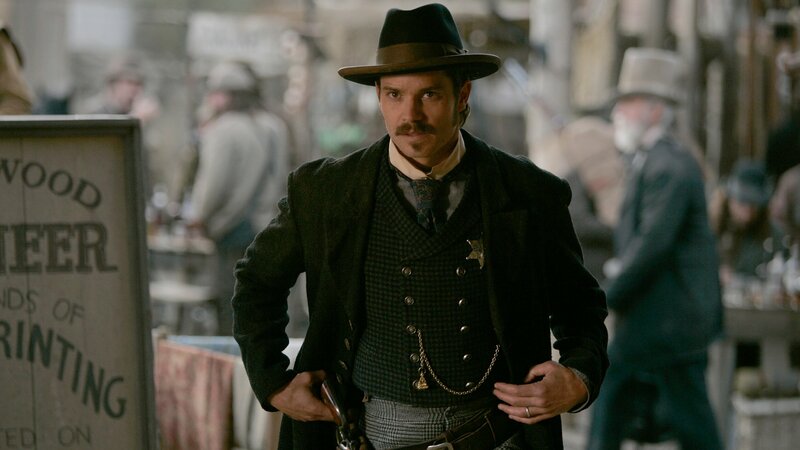 Deadwood is set in a mining town that was not part of any U.S. state in the post-Civil War years, and thus was literally lawless. It attracts people looking to get rich after a gold strike, as well as those looking to capitalize on the lack of organized law. Marshal Seth Bullock relocates to a gold-mining camp and crosses paths with Wild Bill Hickok. Swearengen takes an interest in the survivor; Brom's wife self-medicates. Competition arrives; Hickok puts up collateral in a poker game; Bullock and Star strike a deal. Swearengen directs Farnum to buy back the Garret claim; Alma asks Calamity Jane and Hickok for help. Deadwood must make its own laws to try a murderer; Trixie helps Alma with the Metz child. Bullock encounters resistance in his quest to bring a murderer to justice. After tracking down a murderer, Bullock returns to camp as a changed man. Riders arrive with a vaccine and word of a possible treaty with the Dakota; Alma rethinks her plans. Swearengen calls a meeting to set up an informal government; Bullock and Alma compare notes. Bullock regrets having raised his hand at the government meeting. Alma's father arrives from New York; Swearengen strikes a bargain with Adams. The U.S. Army rolls into Deadwood; Bullock reacts to Russell's intentions regarding Alma.